As a child, my favorite night of the week was pasta night. I might have been too picky to enjoy it with anything but butter - I was a no-sauce, no-vegetables, no-meat kind of girl. But boy did I ever love my buttered pasta! There is something about the way that the noodles are soft-yet-textured that makes the meal ultimately satisfying. In the last few years, with so many low-carb and no-carb diets, many of us have asked ourselves, "Is pasta good for you?" Pasta lovers can finally rejoice because scientists in Italy have decided that yes, yes it is. In a newly published study, scientists from Pisa created a new type of pasta that they believe wards off heart attacks and promotes cardiovascular health. This new Italian pasta is created by combining durum wheat flour (the standard flour used in pasta) with whole-grain barley flour. To test their theory, they fed all types of pasta to lab mice before inducing cardiac arrest. The results: the mice fed the new pasta survived in greater numbers than mice fed traditional pasta. In addition to surviving the heart attack, these mice also sustained less damage to their hearts. The scientists concluded that the beta-glucan in the barley wheat has protective properties and can also enhance the growth of new blood vessels. How's that for super spaghetti! Well, everything in moderation, of course. While this food news is great, there are a few drawbacks. First of all, this type of pasta dough hasn't been mass produced for our consumption (only for those poor lab rats). Secondly, it's important to note that the study was only done on mice and not humans. There will be follow up studies to determine the effects on humans (which hopefully don't involve inducing cardiac arrest). As a functional food, pasta is a staple in many homes because it fits into a busy lifestyle. It's easy to vilify pasta as being a carb-loading meal, but it can also be a vehicle to deliver other nutrients through healthy recipes. Now that I'm less of a picky eater, my favorite pasta is loaded up with fresh vegetables and lean meats in the sauce. Which means that pasta can be a healthy meal! Just maybe avoid eating alfredo-rich pasta more than once a month and you should be good to go. Now that we've made you sufficiently hungry, let's delve into some of our favorite pasta recipes. These are a sure-fire way to deliver some nutrition to your family with delicious results. Pasta Primavera is my favorite way to force the whole family to eat fresh tomatoes. In the summertime, I load this pasta up with zucchini and eggplant from the garden, too. Use any type of pasta you have in the pantry (I like penne, farfalle, or orecchiette pasta). You can also add shrimp or chicken if you don't want a vegetarian version. Get the recipe here. This is the best way to eat your spinach! Tossing the spinach in a creamy sauce with bright lemon and spicy chiles really transforms it into something really special. The best part about this recipe is that instead of using cream, they use yogurt. That makes it satisfying but healthy. Top it off with a little Parmesan cheese and I'm a happy lady. Get the recipe here. OK, I know I said not to eat Alfredo sauce all the time. But this skinny alfredo sauce is a leaner, healthier version that doesn't skimp on any of the flavor! Using milk instead of heavy cream makes this version half the calories of canned alfredo sauce. 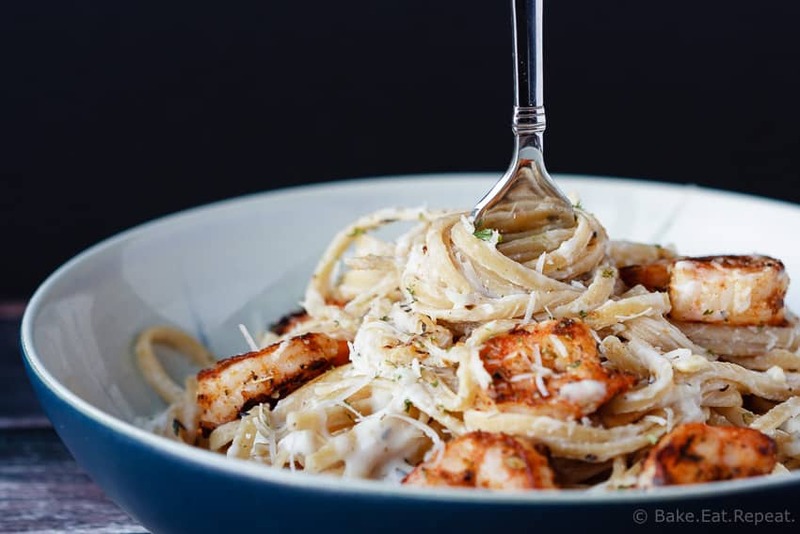 Add some cajun seasoning to spice up the flavors and this may be your new go-to alfredo recipe. This is one recipe that will never leave your recipe box. Find it here. I'm not a vegan, but I will eat vegan food if it's full of flavor. This recipe certainly doesn't taste like it's lacking anything, and it's super healthy because it has so few ingredients. The main ingredient is the roasted red peppers, which add depth when they're charred and a creamy texture from being pureed. 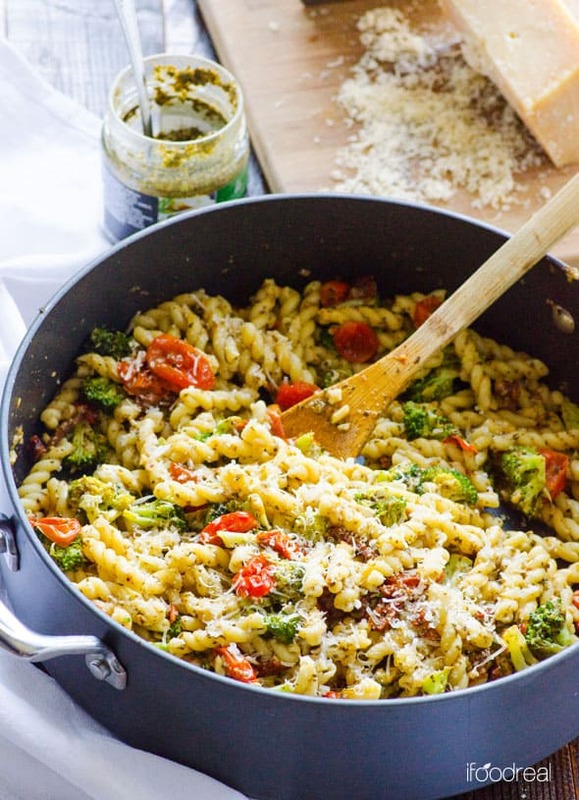 Throw in the nutritional yeast to give it a cheesy flavor and toss it with pasta. Perfect! What's not to like about chicken sausage? It has all the flavor of pork sausage and is significantly healthier for you. In fact, it has so much flavor that this pasta doesn't even really need a sauce! 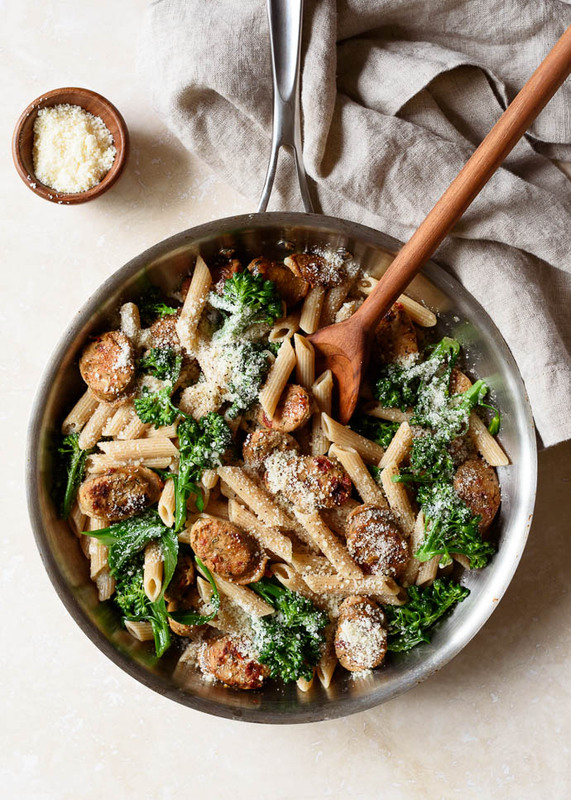 Just toss together the sausage and broccoli with some parmesan cheese in a Dutch oven or large bowl. 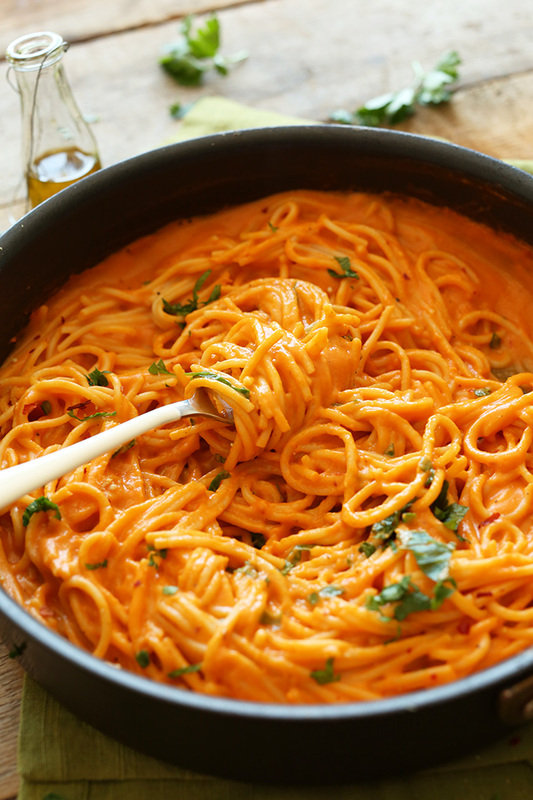 The pasta cooking water is the secret ingredient to bringing all of those flavors together (and thickening the sauce, too). Easy, peasy! Get the recipe here. I love beef stroganoff, but I always feel a little bit guilty about all that red meat and sour cream in the sauce. 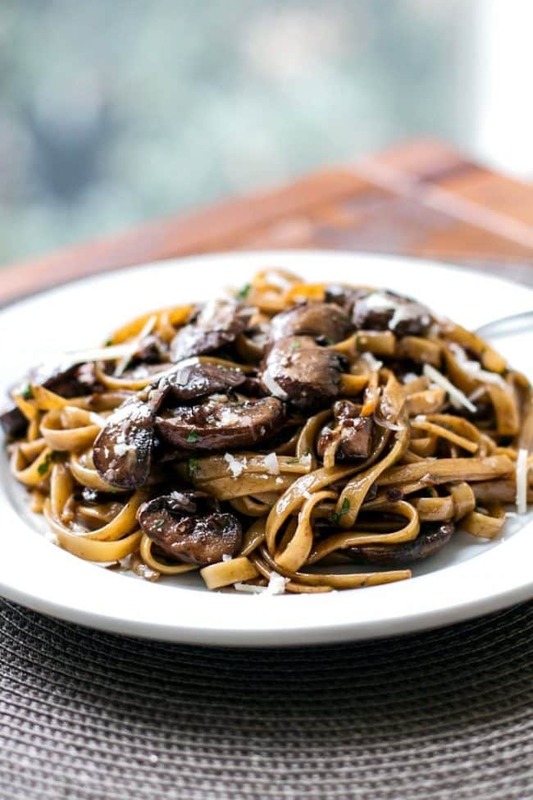 The solution to all my woes is this balsamic mushroom pasta. This recipe combines classically healthy foods for a dish that is full of flavor. The meaty mushrooms combined with tangy, umami-rich balsamic vinegar satisfies all my meat cravings. Then, a little splash of cream adds body to the pasta. I may never go back to the other stroganoff! Get the recipe here. Who needs heavy sauces when you have the flavors of onions and capers? This fresh pasta adds tomatoes and fresh herbs like basil and parsley to the mix to give you an ultimately satisfying meal. 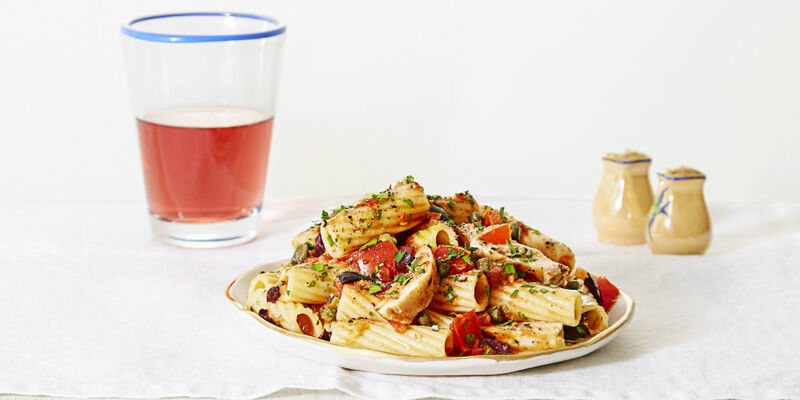 I like using a large pasta like rigatoni in this dish because the sauce is so light and fresh. It's perfect for tasting the whole-wheat pasta flavors! Get the recipe here. When you roast butternut squash, it gets super creamy and soft textured. Puree it with a little milk and you have yourself the perfect faux-alfredo sauce. This recipe uses browned butter to add a little nuttiness to the dish (because a little bit of butter never hurt anyone!). Finish it off with a little rosemary for that fresh flavor and toss it with your favorite fettuccine noodles. Get the recipe here. Pesto is the best way to: 1) sneak some vegetables into your diet; 2) make a healthy, low-cal pasta sauce. It's so easy to make - all you need to do is puree your favorite green with some nuts, garlic, and oil. Then, toss it with your favorite vegetables (in this case, tomatoes and broccoli) and dinner is served. Get the recipe here. 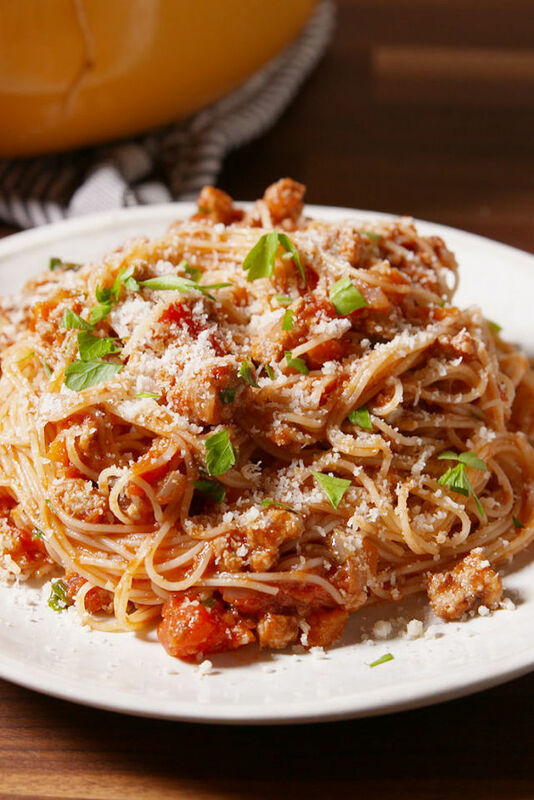 Bolognese is the classic Italian meat sauce. It's usually made with ground beef and some kind of salted pork (whether that's bacon or pancetta). Delicious, but not so heart-healthy. Unless you sub in ground turkey, of course! Eat this one side-by-side with the traditional bolognese and I bet you won't' even be able to tell the difference. Get the recipe here. If you don't feel like making pasta dishes from scratch, we have the hacks for you. Check out the 8 easy things you can to do to transform store-bought sauce into something magnificent.